1 photograph : b&w ; 17 x 20 in. WIlliam Notman founded his photography business in Montreal in 1856. By the 1880's, Notman had expanded his business to over 20 studios throughout Canada and the United States, including one in Halifax. In 1882, Sandham left the business and Notman's son, William McFarlane Notman, because his junior business partner. After Notman's death in 1891, William McFarlane and his brother Charles Frederick carried on business until it was sold to Associated Screen News in 1935. 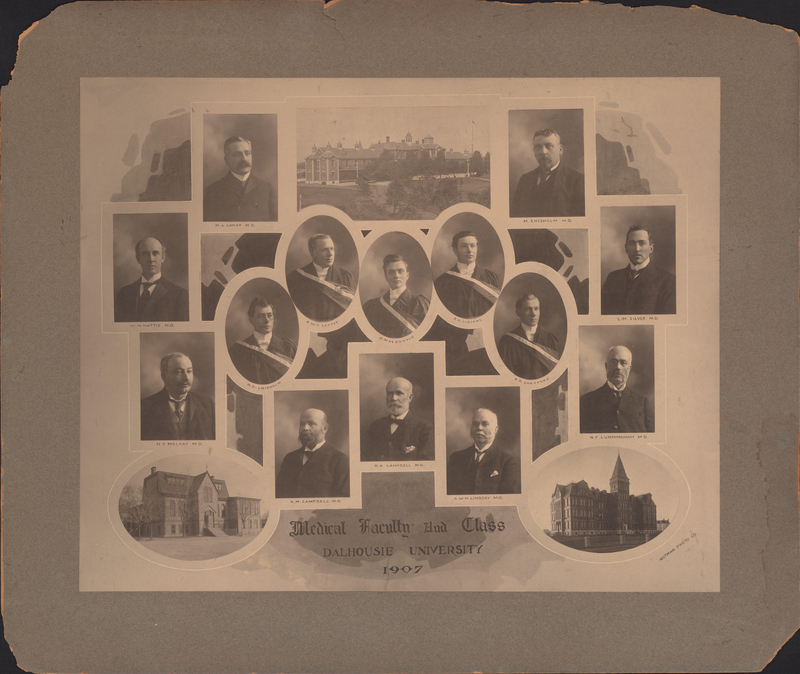 Item is a composite photograph of the 1907 Dalhousie University Medical Faculty and Class. 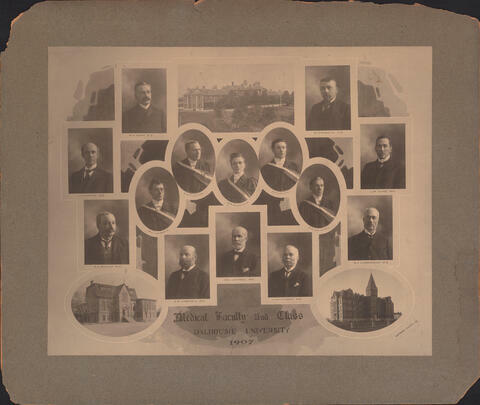 The photograph consists of portraits of G. M. Campbell; D. A. Campbell; A. W. H. Lindsay; N. F. Cunningham; L. M. Silver; M. Chisholm; M. A. Curry; W. H. Hattie; N. E. MacKay; H. D. Chisholm; P. McF. Carter; J. MacDonald; B. A. LeBlanc; and R. O. Shatford arranged around photographs of exteriors of the Forrest Building and two other buildings. Photograph is mounted on a matboard. All four corners of matboard are damaged.